ID WASH washing gantrys and tunnels for heavy goods vehicles. A full range, adapted to all fleets. From small businesses to transport multinationals. Adaptability is Id Wash's strength. From the monobrush to the washing tunnel, via the successful automatic washing gantry, ID WASH anticipates your expectations to offer the best solution for your needs. Depending on the washing frequency required, the washing gantry is available as a washing tunnel which reduces cycle times and increases the number of possible washes per hour. Long experience of heavy goods vehicle washing. Between the arrival and departure of the truck on the washing platform, various key stages ensure optimum washing quality. 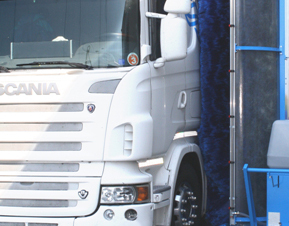 From pre-washing of the HGV with active foam through to rinsing with specific rinse aids, disinfection for refrigerated trucks, our long experience of these vital phases will ensure the perfect finish. 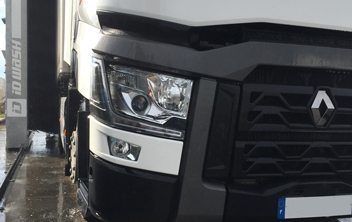 The development of new and dedicated programmes, bringing us into line with current regulations (frontal, pedestrian and blind spot mirrors...), for comprehensive washing of trucks ensuring the safety of these accessories. The result of long experience and the very latest technical developments, the ID3 washing gantry is the Made in France alternative – a perfect compromise between wash quality and low running costs. The washing gantry is a technical development for heavy goods vehicles, entirely made in France and equipped with high volume components to facilitate maintenance and reduce upkeep costs to a minimum. The truck washing gantry is the perfect blend of washing quality and speed. 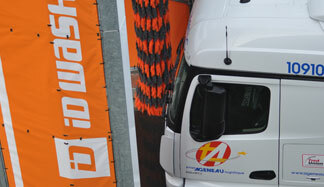 Thanks to its combined washing tunnel operating system, all the key phases of the truck washing process are respected. Washing of the front of the heavy goods vehicle takes place while the truck is stationary then the truck moves forward in order to wash the sides and then stops once more to wash the rear of the vehicle. The monobrush is the low-cost alternative for washing trucks. It is a cleaning apparatus comprising a self-contained trolley, or connected to the mains (water and electricity), coordinated by an operator, and equipped with a vertical brush for washing heavy goods vehicles and various other types of trucks. Because washing heavy goods vehicles is not as simple as just washing the bodywork, ID WASH offers a full range of additional and dedicated washing systems for all types of vehicles and needs: Chassis and bodywork disinfection for refrigerated trucks and tanker trucks in the food industry, chemical spraying, high pressure washing...From tarpaulin semi-trailers to roll-on trucks via platform trucks and tipper trucks. It also combines the concepts of truck washing and ecology thanks to the installation of a system for recycling waste water. ID WASH truck washing gantrys are built to last and also designed to simplify maintenance and reduce costs. High volume components, facilitated maintenance due to easy access to various mechanical parts. Latest generation machine capable of diagnosing faults. Preventive maintenance, emergency breakdown assistance, remote fault handling and diagnostics. Express delivery of parts adaptable to all brands of washing gantrys. Dismantling/Reassembly of vehicle washing installations in the event of change of depot.